Christopher Columbus and a Greek astronomer Ptolemy had an argument about whether the Indies would lie 6000 miles away or less. Christopher Columbus believed that the ships they had could make the journey to the Indies but instead they landed on a new land, America. 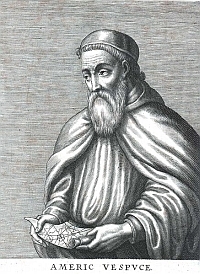 In 1507, Amerigo Vespucius a Italian navigator explored "the new land"
Amerigo then convinced mapmakers that it was not India, or China, or Japan, but a "whole new land"... So then several people agreed to name the new land "America" after Amerigo Vespucius...Columbus got mad that the land was named after someone else because he thought "he found it first."